1. Blend all sauce ingredients not including tomatoes. 2. Pour over spiralized zucchini. 3. Then slice the zucchini from side-to-side to prevent abnormally long strands. 4. 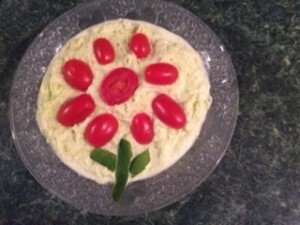 Top with grape tomatoes to make a design. 5. Mix in and serve. Variation: Add one red pepper chopped for Red Pepper Cheeze Sauce. I really enjoys reading your blog and recipes on your site. I would love to know if you have any recipes I can try for my 17 month old son he has a bad allergy to milk protein , and cannot tolerate acidic foods, he loves potatoes in any form but I would like him to enjoy something else . His sister who is 31 months old can get away with eating anything , but he always what’s what she has and visa versa. Lastly they both have fast metabolism sand burn fat fast , they not under weight but they are thin, how do I up their fat intake ? ( I have tried smoothing but they don’t like it, he does not enjoy peanut butter either) . Hi Natasha, I’m glad you enjoy reading my blog. Cow milk protein is not meant for humans and even though your daughter does not have an obvious reaction like your son does, it can lead to many problems later such as overweight, diabetes, cancer and other illnesses. It’s loaded with casein (a protein known to cause cancer), saturated fat and cholesterol, which as loving parents we don’t want for our children. Try the delicious almond and pumpkin seed milks in my recipe book Raw Vegan Recipe Fun for Families. There are 115 easy recipes in that recipe book and children love the full color photos and can recreate many of the recipes. Instead of potatoes you can offer him Tabouleh or Cauliflower Spanish Rice, both in the recipe book and super satisfying and excellent brain food. You can up their fat intake by offering soaked sunflower seeds or pumpkin seeds which are excellent for growing children. Fruit has excellent calories and is a great source of nutrition and glucose for energy for growing children. Peanut butter is not a health food, and is a legume, not a nut. It’s loaded with a mold called aflatoxin and is not meant to eat.